Compatible with IP Server 900 and ESI Communications Servers. ESI Media Management from Action CTI is a hardware/software combination which provides audio and video monitoring directly through a properly equipped IP Server 900 or compatible and properly equipped ESI Communications Server. Action CTI has the trained personnel who can enable your system for maximum efficiency. What is ESI Media Management?  ESI Media Management from Action CTI is a hardware/software combination which provides audio and video monitoring directly through a properly equipped IP Server 900 or compatible and properly equipped ESI Communications Server. These advanced capabilities help you reduce many of the inherent risks in your organization. Additionally, ESI Media Management is an “all-in-one” solution that eliminates the need to install and manage multiple systems from various vendors. Building access events from across your facility with ESI Presence Management. Hardware — In a compatible ESI Communications Server, one Applications Services Card (ASC) is required to serve as the repository for all data collected by ESI Media Management applications. The same capabilities are built into the IP Server 900. ESI Media Manager — This Windows®-based application is your one-stop interface for accessing data stored on the ASC or IP Server 900. ESI Media Manager lets you easily filter and review data. ESI Video Viewer — A Windows-based application that lets your authorized users see live video provided by your ESI Communications Server via ESI Media Management. Compatible video camera(s) — Each compatible NTSC (analog) video camera communicates with its own ESI Video Adapter. ESI Media Management accepts a wide variety of third-party camera modes, both color and black-and-white. (Your Certified ESI Reseller will have more details.) An ESI-approved IP video camera3 doesn’t require the ESI Video Adapter. Call logging — ESI Media Management gives you the flexibility to choose which calls to record — either all calls or selected lines, departments, or extensions. SMDR call activity records — With ESI Media Management, the system stores SMDR (call activity) data. 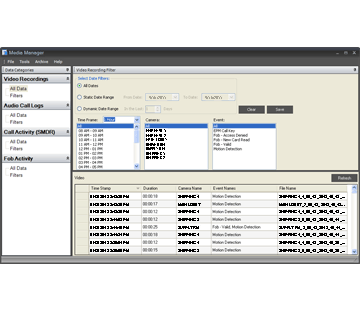 ESI Media Manager software enables authorized users to find, sort, and evaluate basic SMDR data, which can be exported to standard .CSV-format files for use in a spreadsheet or database. Surveillance of controlled areas — Your organization probably has one or more secured areas where valuable property is located. You can further protect your property by adding video monitoring to areas such as computer rooms, warehouses, or medicine closets. Your compatible ESI system can be programmed to alert users via pop-up video whenever motion is detected by analog or compatible IP cameras. Video recording — If equipped, video data from the cameras are streamed to and saved on the ESI system. ESI Media Manager makes it easy to view the video data, which is stored on the system as MPEG-4 files that ESI Media Manager can save to a PC. Enhancements to ESI Presence Management — In combination with ESI Presence Management, ESI Media Management’s video capabilities let you put a face with a fob and actually see who’s entering your building. If access is denied, you can visually determine who tried to gain access. You also know who you’re admitting, by communicating with delivery personnel or visitors to your facility. Users of ESI Video Viewer software can respond automatically to calls and fob-access events in ESI Presence Management. Data filtering — With ESI Media Manager, it’s simple to find critical business information using built-in filters, as well as to store favorite filters for later use. Data archiving — An administrator-level user can set automatic archival of stored data. Specific data can easily be exported to standard PC formats (e.g., .WAV, .M4V). Ease of use — Anyone who can point and click a mouse can use ESI Media Management. Ease of control — The ESI Media Manager and ESI Video Viewer applications are managed through the compatible ESI system. It’s easy to control what stored information, and which camera views, are available for each authorized user. Business phone systems compatible with ESI Media Management include IP Server 900, ESI Communications Servers (ESI-1000, ESI-600, ESI-200, ESI-100, ESI-50, upgraded ESI-50) as shown below. Video recording disclaimer: The ESI Media Manager application, the ESI Video Viewer application, and the ESI Video Adapter — hereafter collectively referred to as “ESI Media Management” — constitute a surveillance product only. It is not expressly stated or implied that ESI Media Management shall protect or secure any property, possession or person, animal or public good. ESI relies solely on the ESI Reseller’s and end user’s investigation of ESI Media Management itself as to whether it shall be suitable for the purposes for which it is intended. ESI has used its best endeavors to ensure that ESI Media Management shall be suitable for its general intended purpose, surveillance. In recognition of these best endeavors, anyone using ESI Media Management agrees that ESI shall not be responsible for any defects or occurrences that may arise from or during the use of ESI Media Management with any other products, goods, or services. Camera surveillance can be prohibited by laws that vary from state to state, as well as by union guidelines. ESI advises that the ESI Reseller, end user, or third-party installer take any necessary precautions and training to understand and adhere to local, federal, and union guidelines for installing and using video in the home, workplace, or other environment. ESI is not responsible for educating the ESI Reseller or end user on either the law (local or federal) or union guidelines. Audio recording disclaimer: IN MOST JURISDICTIONS, IT IS PERMISSIBLE TO RECORD A CONVERSATION IF ONE OF THE TWO PARTIES IS AWARE THAT IT IS BEING RECORDED. HOWEVER, ESI TAKES NO RESPONSIBILITY AS TO ITS LEGALITY IN ALL JURISDICTIONS. IT IS THE RESPONSIBILITY OF THE INSTALLING COMPANY AND THE END USER TO DETERMINE AND FOLLOW THE APPLICABLE STATE AND LOCAL LAWS REGARDING RECORDING OF CONVERSATIONS.